Today, Vermont Department of Environmental Conservation (DEC) staff paid us a visit. Clean Water Initiative Operations Coordinator Helen Carr and Best Management Practices Verification Coordinator Jordyn Geller assessed the riparian buffer planting that came into being in the garden’s second season. The project began back in May 2015 when U.S. Fish and Wildlife and Friends of the Winooski River staff and volunteers transformed the land beyond the garden fence. DEC staff assess the riparian buffer against a checklist of factors. 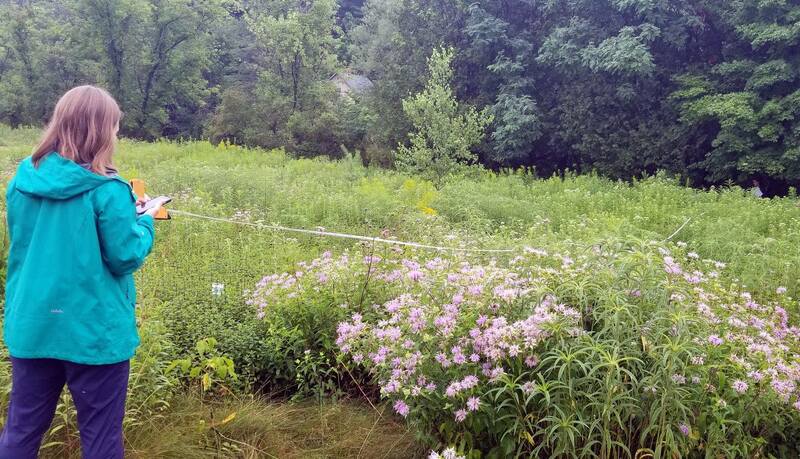 Vermont Department of Environmental Conservation staff measure the riparian buffer.